This is a Korean name; the family name is Yoo. 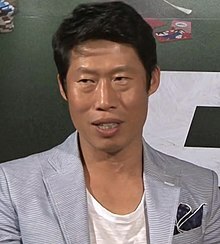 Yoo Hae-jin (born January 4, 1970) is a South Korean actor. As a child Yoo Hae-jin would often slip in through the backdoor of a cultural center near his home to watch events that were being held there. After seeing a play in eighth grade, the teenager decided on acting as his future career. He begged to be sent to an arts high school, but his family was conservative and not financially capable. So in his junior year in high school, Yoo joined an acting troupe. In the beginning, he ran errands for the other actors and tried to copy what they did from a distance. Though introverted, Yoo slowly began to learn how to act on stage. After applying twice for a Theater and Film course in college and getting rejected because of his looks, Yoo majored in Fashion Design instead. But acting remained his passion and he concentrated on his theater work rather than his fashion subjects, barely graduating. Due to a special selection process for college graduates based solely on their grades, Yoo was finally accepted to the theater department of the Seoul Institute of the Arts. Yoo then began doing bit roles in films, graduating to supporting roles where he acquired a reputation as a scene stealer. Despite a short screen time, his performances made a strong impression on audiences and critics. As Korean films became more diverse in terms of genre, Yoo found opportunities in increasingly weighty roles, and now has become a bonafide marquee name in the box office. He has since established himself as one of the top character actors in the country, notably in King and the Clown, Small Town Rivals, Jeon Woo-chi: The Taoist Wizard, Moss, The Unjust, The Pirates, The Classified File, Minority Opinion, Veteran, and Public Enemy and its sequels. 2017 was a successful year for Yoo - he had roles in three high-grossing films; Confidential Assignment, A Taxi Driver and 1987: When the Day Comes. In particular, A Taxi Driver earned him a Best Supporting Actor award at the Korean Association of Film Critics Awards and a nomination at the Asian Film Awards. Thereafter, Yoo began to take up lead roles. His lead starring film, Luck Key, surpassed 5 million viewers. He next starred in family comedy Love+Sling, and Intimate Strangers, a remake of the Italian comedy film Perfect Strangers. In 2018, he was cast in the historical war film Battle. He has also appeared as a regular cast member in two reality shows: 2 Days & 1 Night from March to November 2013, and Three Meals a Day: Fishing Village in January 2015. Yoo and actress Kim Hye-soo first met in 2001 after shooting the movie Kick the Moon and became close in 2006 after appearing together in Tazza: The High Rollers. Rumors of the two dating surfaced starting 2008 although both continuously denied any romantic involvement until early 2010 when paparazzi photographs of the two were released, and the couple officially confirmed their relationship. Yoo and Kim broke up in 2011. On November 24, 2018 Yoo's agency announced Yoo's father passed away. ^ Choi, Ji-eun (25 August 2010). "INTERVIEW: Actor Yu Hae-jin - Part 1". 10Asia. Retrieved 2012-11-18. ^ Choi, Ji-eun (25 August 2010). "INTERVIEW: Actor Yu Hae-jin - Part 2". 10Asia. Retrieved 2012-11-18. ^ Choi, Ji-eun (25 August 2010). "INTERVIEW: Actor Yu Hae-jin - Part 3". 10Asia. Retrieved 2012-11-18. ^ "Yoo Hae-jin". Korean Film Council. Retrieved 2012-11-18. ^ "Yu Hae-jin Reveals What Gives Him the Most Pleasure". The Chosun Ilbo. 17 September 2015. Retrieved 2015-09-19. ^ "Yoo Hae-jin still finds each film set 'new'". Kpop Herald. 15 January 2017. ^ "Actors Hyun Bin and Yoo Hae-jin speak about 'Confidential Assignment'". Yonhap News Agency. 18 January 2017. ^ "1987 Adds YOO Hae-jin, YEO Jin-gu and SUL Kyung-gu". Korean Film Biz Zone. 6 April 2017. ^ "YOO Hae-jin and LEE Joon's KEY OF LIFE Began to Shoot". Korean Film Biz Zone. October 12, 2015. ^ "LUCK-KEY Surpassed 5 Million Viewers". Korean Film Biz Zone. 3 November 2016. ^ "YOO Hae-jin, LEE Sung-kyoung, and KIM Min-jae Starring Love+Stling Finishes Filming". Korean Film Biz Zone. 9 November 2017. ^ "Putting his best foot forward : In 'Love + Sling,' Yoo Hai-jin plays a father helping his son succeed". Korea JoongAng Daily. 10 May 2018. ^ "PERFECT STRANGERS Remake Begins Production". Korean Film Biz Zone. 29 January 2018. ^ "RYU Jun-yeol and YOO Hae-jin Prepare for BATTLE". Korean Film Biz Zone. 28 August 2018. ^ Lee, Jin-ho (11 March 2013). "Yu Hae Jin to Join 1 Night, 2 Days". enewsWorld. Retrieved 2013-03-17. ^ Kim, Tong-hyung (12 March 2013). "Midweek roundup: In case you missed it". The Korea Times. Retrieved 2013-03-17. ^ Lee, Sun-min (12 March 2013). "Yu Hae-jin to join 1 Night 2 Days". Korea JoongAng Daily. Retrieved 2013-03-17. ^ Jin, Eun-soo (13 January 2015). "Three Meals a Day spawns spinoff". Korea JoongAng Daily. Retrieved 2015-01-21. ^ Kim, Yeon-ji (19 June 2015). "Yoo Hae-jin continues to work hard". Korea JoongAng Daily. Retrieved 2015-06-19. ^ 김혜수에게 유해진은?…측근 "혜수에게 가장 완벽한 남자". Sportsseoul (in Korean). 1 January 2010. Retrieved 2012-11-18. ^ 김혜수·유해진, 2010 첫 스타커플…"2년간 비밀 데이트" (종합). Sportsseoul (in Korean). 1 January 2010. Retrieved 2012-11-18. ^ Park, Sun-young (4 January 2010). "Kim Hye-soo, Yoo Hae-jin are officially out as a couple". Korea JoongAng Daily. Retrieved 2012-11-18. ^ "Kim Hye-soo Dating Yu Hae-jin; No Marriage Plan Yet". The Korea Times. 4 January 2010. Retrieved 2012-11-18. ^ Kim, Jessica (4 January 2010). "Kim Hye-soo admits to dating Yu Hae-jin". 10Asia. Retrieved 2012-11-18. ^ "Kim Hye-soo and Yu Hae-jin Confirm Relationship". The Chosun Ilbo. 5 January 2010. Retrieved 2012-11-18. ^ "Kim Hye-soo and Yu Hae-jin's Romantic Relationship Confirmed". KBS Global. 5 January 2010. Retrieved 2012-11-18. ^ Kim, Jessica (4 April 2011). "Kim Hye-soo, Yu Hae-jin break off relationship". 10Asia. Retrieved 2012-11-18. ^ "Beauty and the Beast Call It Quits". The Chosun Ilbo. 5 April 2011. Retrieved 2012-11-18. ^ "Kim and Yoo break it off after 3-year relationship". Korea JoongAng Daily. 6 April 2011. Retrieved 2012-11-18. ^ "유해진 측 "오늘 부친상…26일 발인" [공식]". Tv Report (in Korean). 24 November 2018. ^ "유해진, 오늘(24일) 부친상 [공식입장]". Tv Daily (in Korean). 24 November 2018. ^ Lee, Claire (24 October 2012). "Four local actors voice Hollywood-animated film". The Korea Herald. Retrieved 2012-11-18. ^ "'Korean Hostel in Spain' is open for business". Korea JoongAng Daily. March 15, 2019. ^ "43rd Crowns King and the Clown". Korean Film Biz Zone. 26 July 2007. ^ ""The Man From Nowhere" sweeps Korea Film Awards". 10Asia. 19 November 2010. ^ Conran, Pierce (24 November 2014). "ROARING CURRENTS Tops 51st Daejong Film Awards". Korean Film Biz Zone. Retrieved 2015-08-08. ^ "Kofra Film Awards Recognizes CHUN Woo-hee". Korean Film Biz Zone. 28 June 2015. ^ Conran, Pierce (27 May 2015). "CHOI Min-sik and REVIVRE Triumph at 51st Paeksang Arts Awards". Korean Film Biz Zone. Retrieved 27 May 2015. ^ "Kim Hye-soo and Sul Kyung-gu to be awarded the Best Actress and Actor". Hancinema. Segye. 20 September 2015. ^ "YOO Hae-jin and KIM Min-hee Take Acting Honors". Korean Film Biz Zone. 16 December 2015. ^ "THE FORTRESS Dominates 37th Korean Film Critics Association Awards". Korean Film Biz Zone. 30 October 2017. ^ "Asian Film Awards 2018 nominations". South China Morning Post. January 11, 2018. ^ "청룡영화상 후보 발표, '1987' 최다·'공작'도 9개부문 후보". Newsen (in Korean). 1 November 2018. This page was last edited on 20 April 2019, at 07:31 (UTC).